Note: Remember to respect the author's rights. I'm not responsable for the misuse of this work by any person. Remember the repercussions it could brings to you. Use it as reference or reading only. This essay is a true story. It happened to me. Run as fast as you can. The scariest moment of my life. There he is, I thought, is he going to kill me? I asked myself when I was 11 years old, and I saw the man that tried to kill my brother a few days before. I was on my way to the bakery to buy bread, as my mom asked me to do so, when I saw this tall and skinny guy facing my direction. When I saw him closer, I noticed who he was. I thought he has see me already, so in that moment I couldn’t think to hide, I just ran away and jumped a fence. Let me tell you what really was going on. Two or three days before, my older brother, a short build man, got in to a fight with “EL Flaco”, as everybody knows him, and the people who saw them fighting said that el Flaco was losing the fight, and ran to his car, opened the trunk and got a machete. When my brother saw him with his machete, he started to run. Then my brother saw a brick on the grass, took it and tried to defend himself with it. He tried to turn around, but he fell onto the ground and el Flaco attacked him. What could my brother do at that moment? My brother is the strongest man I know. People have seen him fighting three men at a time and won the fight. But, the fight wasn’t fair this time, my brother was in disadvantage. So, he just used his bare hands to repel the attack, and stopped the machete before it touch his face. For some seconds, he thought he succeed, and el Flaco did not kill him. Well, that was true, but you can’t walk away from a hard battle without wounds. 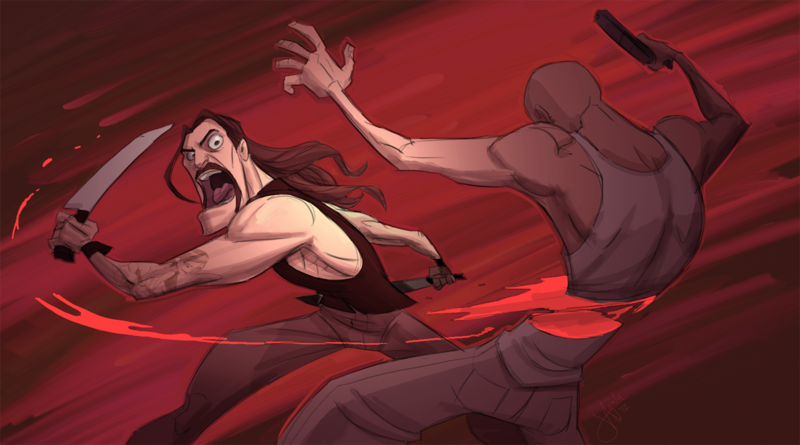 My tiny, but strong brother, was on the floor, with his hand around the sharp machete, when el Flaco pulled it away. It left deep wounds on both of my brother’s hands. The guy just walked away and ignored the fact that the severe loss of blood could kill him. That person was bad, and didn’t care if the bleeding human being on the floor died or not. So he became the scariest man in the world for me. A few days later we were walking facing each other, so it scared me to death. I ran fast, I jumped a fence, I was looking in all directions just in case he decided to follow me trying to kill me as he tried to kill my brother. My brother almost bled to death, but he survived. Would el Flaco be so mad that he would think to kill my brother’s siblings too? I was so young, that I just got a surviving instinct, and ran as fast as I could. So, I still think, if something like that happen to you, run as fast as you can.